I am calling this very abstract piece of music “Dark Time” – a reflection on the concepts of dark energy and dark matter. Dark Time, as defined by myself, passes just like ordinary time… however, for some reason science still cannot quite understand, it is not available for doing work. As a matter of fact, we don’t even notice it passing. We only know that Dark Time has passed – or that we have passed through it, depending on your preferred frame of reference – when we see that the clock has moved on… and nothing got done. Dark Time – a fairly quiet abstract soundscape, a little over 14 minutes long, 12.6 MB to download, in the iTunes AAC/.m4a format. Almost all of the sounds are processed hits and scrapes on various gates and doors around Cork City. A plastic wheel bin and some empty beer kegs left out in Market Lane also feature prominently in the mix. For a bit of extra sparkle, my brass chimes on a string make an appearance as a “Special Guest”. 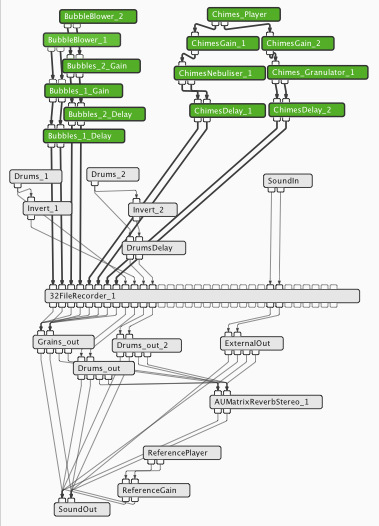 I am close to finishing the development of the first version of my Cork City Gamelan dedicated sample player. I use the patcher software Audio Mulch for building it. As I go along, I play and record little pieces of music to test all the different features I would like to include. The music I am sharing today verifies the multitrack recording capabilities. I performed six simultaneous instrument parts live and recorded them in a single take in six separate stereo files, making it possible to tweak the final mix using my DAW software (Logic Pro). All the examples I have recorded so far are slowly evolving soundscapes. This will change next week: I plan to get hardware controllers with knobs, sliders and buttons. Right now, I must play everything using only my mouse and the typing keyboard. Enjoy, and feel free to share and remix it. The rules are in the Disclaimer page.